1 X HP 22,HP22,C9352AE,C9352A. ARE THESE REFILLED?. SALE PRICE?. WILL I GET A RECEIPT?. WHAT IS THE EXPIRY DATE?. = INDATE BY ONE YEAR OR MORE. ARE THESE BOXED?. WHICH PRINTERS DO THESE FIT?. HP Deskjet F388, HP Deskjet F390, HP Deskjet F394,HP Deskjet F2100, HP DeskJet F2110, HP Deskjet F2120, HP Deskjet F2128, HP DeskJet F2140,HP Deskjet F2149, HP Deskjet F2179, HP Deskjet F2180, HP Deskjet F2185, HP Deskjet F2187,HP Deskjet F2188, HP Deskjet F2200, HP Deskjet F2280, HP Deskjet F2290,HP Deskjet F4100, HP Deskjet F4135, HP Deskjet F4140, HP Deskjet F4150, HP Deskjet F4172. We are not associated with any printer and /or original printing supplies manufactured. Duty Cycle: Approx. 500 pages black @ 5% average coverage. C9351A Black x 1. One GENUINE remanufactured HP 21 XL. HP Deskjet: F370, F375, F380, 3920, 3940, D1360, D1460, D1470, D1560, D2330, D2360, D2430. D2460, F2180, F2187, F2280, F2290, F22244, F4140, F4172, F4180, F4190HP Officejet 4315, 4355, J3680. Our B3P21A is the remanufactured version of the genuine 727 yellow ink cartridge, compatible with multiple DesignJet printers.Although this is not an original product, our remanufactured B3P21A remains compatible with all of the same fantastic printers an even contains the same 130ml of yellow ink. 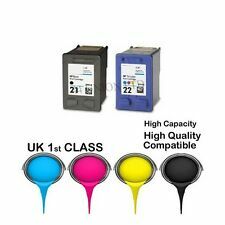 The compatible yellow ink within this cartridge in the 727 range is of exceptional quality and when held side by side with an original print, the result are still impressive.This remanufactured 727 yellow ink cartridge comes with a 100% satisfaction guarantee, making your purchase even simpler. Click here for more details. HP Deskjet F2280. HP Deskjet F2200 series, F2210, F2212, F2214, F2224, F2240, F2250, F2275, F2280, F2290. HP Deskjet 2149, 2180. HP Deskjet 3747, 3910, 3915, 3918, 3920, 3930, 3938, 3940. HP Deskjet D1330, D1341, D1360, D1420, D1430, D1445, D1455. The quality of JetTec products is second to none. MPN : 101H090113. Refill Kits. InkJet Printer Paper. Image & Recovery Software. We endeavour to dispatch all orders within 24 hours excluding weekends. 21 (C9351AE). Officejet : 4311 AIO, 4312 AIO, 4314 AIO, 4315 AIO, 4317 AIO, 4319 AIO, 4352 AIO, 4353 AIO, 4355 AIO, 4357 AIO, 4359 AIO, J3608 AIO, J3640 AIO, J3650 AIO, J3680 AIO. Fax : 1250. Compatible Printers. F2200 F2210 F2212 F2235 F2240 F2250 F2275 F2224 F2280 F2290 F310 F325 F335 F340 F350 F370 F375 F378 F380 F385 F388. Deskjet 2149 2180 3747 3900 3910 3915 3918 3920 3930 3930v 3938 3940 3940v D1311 D1320 D1330 D1341 D1360 D1368 D1400. (2 x 22XL Colour. - Replaces: HP 21XLBK, 22XL C. Deskjet 2149 2180 3747 3900 3910 3915 3918 3920 3930 3930v 3938 3940 3940v D1311 D1320 D1330 D1341 D1360 D1368 D1400. - Colour: Black, Colour. This is for a compatible product NOT an O.E.M product.). This remanufactured valuepack contains one black ( 21XL/C9351CE) and one colour ( 22XL/C9352CE) cartridge for use with the printers listed above. Our remanufactured 21XL black & 22XL colour ink cartridges are filled to the very same capacity as 21XL/ 22XL original ink cartridges. This makes our our remanufactured valuepacks a great deal with a full 12ml of high quality ink in each cartridge. Remanufactured C9351CE & C9352CE ink cartridges not only offer great value, but are better for the environment as well. The prices of all of our ink cartridges include both VAT and postage in the price shown. Click here for more details. OEM C9351AE. Inkjet Catridge. For Inkjet Printers Yes. Colour: Black. Colour Black. Ink Colour Black. Product Code: OB00876. For Laser Printers No. This remanufactured valuepack contains 3x black ( 21XL/C9351CE) and 2x colour ( 22XL/C9352CE) cartridge for use with the printers listed above. Our remanufactured 21XL black & 22XL colour ink cartridges are filled to the very same capacity as 21XL/ 22XL original ink cartridges. This makes our our remanufactured valuepacks a great deal with a full 19ml of high quality ink in each cartridge.Remanufactured C9351CE & C9352CE ink cartridges not only offer great value, but are better for the environment as well. The prices of all of our ink cartridges include both VAT and postage in the price shown. Click here for more details. This remanufactured valuepack contains 2x black ( 21XL/C9351CE) and 1x colour ( 22XL/C9352CE) cartridge for use with the printers listed above. Our remanufactured 21XL black & 22XL colour ink cartridges are filled to the very same capacity as 21XL/ 22XL original ink cartridges. This makes our our remanufactured valuepacks a great deal with a full 19ml of high quality ink in each cartridge. Remanufactured C9351CE & C9352CE ink cartridges not only offer great value, but are better for the environment as well. The prices of all of our ink cartridges include both VAT and postage in the price shown. Click here for more details. Cartridge in package. Package damaged. Our remanufactured 21XL (or C9351CE) ink cartridges are filled to the very same capacity as 21XL original ink cartridges. This makes our our remanufactured 21 a great deal with a full 12ml of high quality black ink. Remanufactured C9351CE cartridges not only offer great value, but are better for the environment as well. 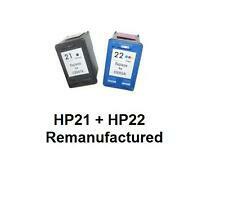 A full list of printers compatible 21XL remanufactured ink cartridges can be found above. The prices of all of our ink cartridges include both VAT and postage in the price shown. Guaranteed To Work With The Following Printers:. The quality of Jet Tec products is second to none. HP Deskjet 5420. HP Deskjet 5420v. HP Deskjet 5432. HP Deskjet 5440. HP Deskjet 5440xi. HP Deskjet 5442. HP Deskjet 5443. JET TEC HP901XL HIGH CAPACITY REMANUFACTURED HP CC656AE COLOUR INK CARTRIDGE Our Hewlett Packard 901 colour remanufactured ink cartridges are an excellent alternative to the originals, producing professional prints at a fraction of the price. HP C9351CE (21XL) Black. HP C9352CE (22XL) Colour. Compatible with HP Printer Model: Deskjet:-3747 3900 3910 3915 3920 3930v 3940 D1300 D1311 D1320 D1341 D1360 D1368 D1400 D1415 D1420 D1430 D1445 D1455 D1460 D1468 D1470 D1560 D2320 D2330 D2345 D2360 D2368 D2400 D2430 D2445 D2460 D3160 F310 F325 F340 F350 F370 F378 F380 F385 F388 F390 F2100 F2110 F2140 F2180 F2187 F2200 F2224 F2275 F2276 F2280 F2288 F4100 F4140 F4172 F4180 F4185 F4190. 21XL black prints approx 475 pages. 22XL colour prints approx 415 pages. Suitable for the following printers. HP Deskjet F2280. HP Deskjet 2149, 2180. HP Deskjet 3747, 3910, 3915, 3918, 3920, 3930, 3938, 3940. (1 x 22XL Colour. - Replaces: HP 21XLBK, 22XL C. Deskjet 2149 2180 3747 3900 3910 3915 3918 3920 3930 3930v 3938 3940 3940v D1311 D1320 D1330 D1341 D1360 D1368 D1400. - Colour: Black, Colour. This is for a compatible product NOT an O.E.M product.). HP C9351CE (21XL) Black. HP C9352CE (22XL) Colour. Officejet :- 4300 4311 4312 4314 4315 4317 4319 4352 4353 4355 4357 4359 5605 J3680 J5520. Manufactured ISO9001, ISO4001, RoHS, Reach Standards. Compatible with HP Printer Model: Deskjet:-3747 3900 3910 3915 3920 3930v 3940 D1300 D1311 D1320 D1341 D1360 D1368 D1400 D1415 D1420 D1430 D1445 D1455 D1460 D1468 D1470 D1560 D2320 D2330 D2345 D2360 D2368 D2400 D2430 D2445 D2460 D3160 F310 F325 F340 F350 F370 F378 F380 F385 F388 F390 F2100 F2110 F2140 F2180 F2187 F2200 F2224 F2275 F2276 F2280 F2288 F4100 F4140 F4172 F4180 F4185 F4190. Inkjet Catridge. We partner with worldwide carriers to ensure you receive the best possible service. Colour: Black. 1 x 22XL Colour. - Replaces: HP 21XLBK, 22XL C. D2360 D2368 D2430 D2445 D2460 D2466 D2468 F2100 F2110 F2120 F2128 F2140 F2149 F2179 F2180 F2185 F2187 F2188. Deskjet 2149 2180 3747 3900 3910 3915 3918 3920 3930 3930v 3938 3940 3940v D1311 D1320 D1330 D1341 D1360 D1368 D1400. This remanufactured valuepack contains 2x black ( 21XL/C9351CE) and 1x colour ( 22XL/C9352CE) cartridge for use with the printers listed above. 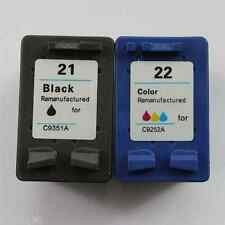 Our remanufactured 21XL black & 22XL colour ink cartridges are filled to the very same capacity as 21XL/ 22XL original ink cartridges. This makes our our remanufactured valuepacks a great deal with a full 19ml of high quality ink in each cartridge. Remanufactured C9351CE & C9352CE ink cartridges not only offer great value, but are better for the environment as well. The prices of all of our ink cartridges include both VAT and postage in the price shown. Guaranteed To Work With The Following Printers:. 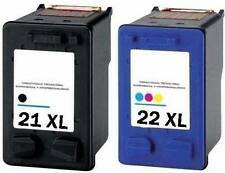 Remanufactured 21XL Black & 22XL Colour Ink Cartridge Combo fit HP Deskjet F2290. Remanufactured 21XL Black & 22XL Colour Ink Cartridge Combo fit HP Deskjet F2200. 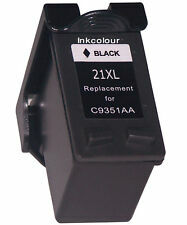 Remanufactured 21XL Black & 22XL Colour Ink Cartridges fits HP Officejet 4315. Model: C9351AE. All goods are new unless stated otherwise.